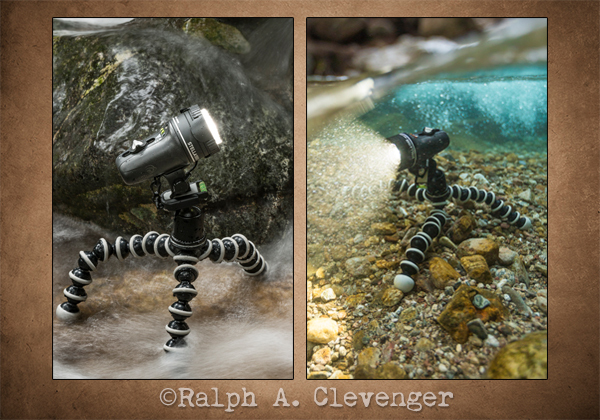 The Light & Motion Stella LED lights are equally at home above and below the water. Most lights made for use underwater can’t be used above the water because of overheating but you can take the Stella’s from water to air and back without even thinking. This is one of the things that makes the Stella’s such a boon to creative lighting. 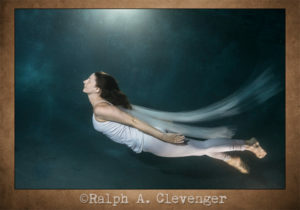 The over/under image (left) has a Stella 2000 above and a Stella 5000 below to create a very even lighting pattern in this portrait of a yoga instructor. 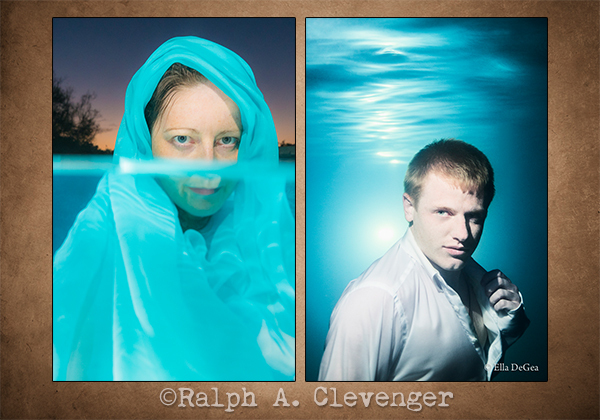 One of my students, Ella DeGea, lit this great underwater portrait (right) with a Stella 5000 and put a Stella 2000 in the background to create that water “ceiling” reflection behind him. Since the LED’s aren’t as powerful as flashes, I needed a pretty low ambient to ensure that you could see the effect of the Stella lights. We did this pool shoot in the evening and hung a Stella 2000 down into the water from the diving board as a back light. The key light in both images was a Stella 5000 with a 50° Fresnel and I used a Stella 1000 for additional light. Unlike flash you can see the light so it’s easy to feather the beam to get exactly what you want. 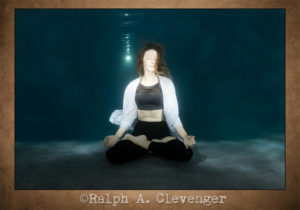 Yoga swimming image: ISO 800, f/6.3, 1/80th second with Sony A7R2, 16–35mm lens in a Sea & Sea housing. Photographing in the ocean adds a lot more difficulty, especially in the cooler waters of southern California. We lit the mermaid from camera right with 2 Stella 5000’s and back lit her with a Stella 2000. A foggy morning provided the low ambient lighting environment. 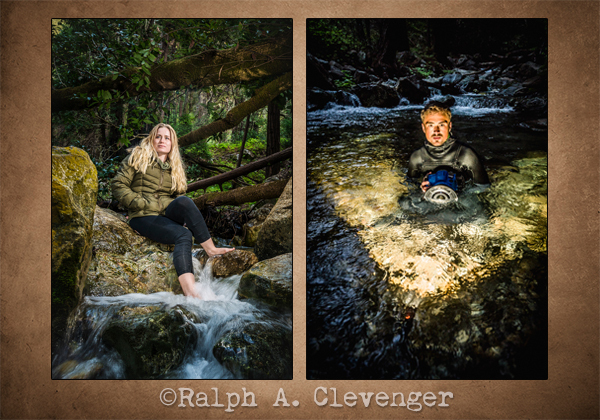 Coordinating the positioning of two lighting assistants, getting the mermaid to pose while holding her breath, while I’m trying to stay neutrally buoyant and having to come to the surface every minute, makes these images really challenging. My mermaid had the hardest job, and she was amazing. 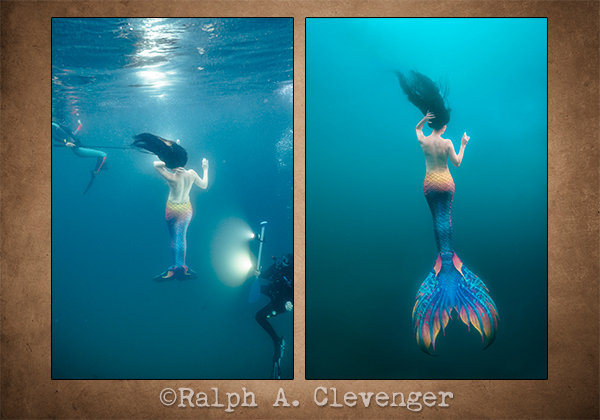 Mermaid image: ISO 800, f/5.6, 1/320th sec with Sony A7R2, 16–35mm lens in a Sea & Sea housing. Over the past year I’ve been working with the people at Light & Motion to show off their incredible Stella LED lights. There’s lots of benefits to using LED lights for both photography and video. These continuous lights are powerful, lightweight, don’t generate heat, don’t need to be plugged in, produce daylight balanced light, are dimmable and, as a bonus, several of the Light & Motion Stellas are completely submersible. I’ve got the Stella 5000, Stella 2000 and the Stella 1000 lights. They can go anywhere I can go. The shot on the left is the final of Gabbie with the 3 lights. I lit the portrait of Daniel with just the Stella 1000 underwater in front of him. ISO 2500, f/4, 1/60th sec with the Sony A7R2, 16–35mm f/4. 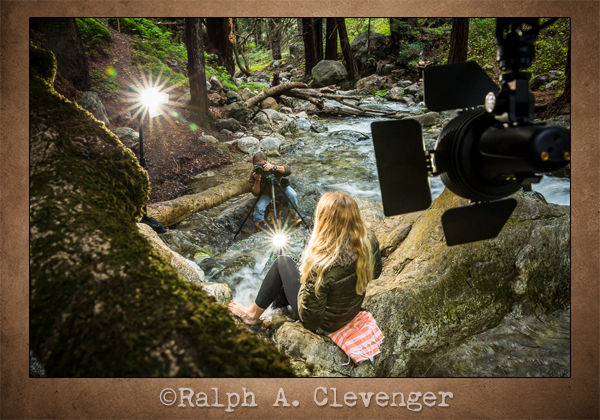 All content ©Ralph A. Clevenger. Nothing may be used in any form, including copying images to personal websites or sharing sites, without written permission from Ralph A. Clevenger.